The Pintail SF connector range provides low-cost, screened, weathertight push-pull interconnection for industrial applications. SF connectors build an indoor/outdoor interconnect system that offers the performance and reliability of MIL connectors at the cost of a commercial (COTS) product. The SF (panel mounting hole sizes 6mm, 8mm, 10mm, 12mm, 16mm and 20mm) series of multi-pin, push-pull coupling connectors will provide IP67 integrity when mated and will work reliably indoors and out. They are widely used for safe control and power connections between equipment where IP67 is critical, e.g. in instrumentation, medical, process control, industrial machinery, and other applications like LED lights and LED display walls, outdoor security cameras, etc. SF Series IP67 connectors have a self catching system which is renowned for its quick and easy mating and unmating. This unique, easy to use, push-pull locking system, reduces the time taken to achieve a robust, waterproof IP67 seal by a factor of up to 10 times compared to a traditional screw-thread mechanism. It also provides security against vibration, shock or pull on the cable and facilitates operation in a very limited space. The push and pull system also allows the connector to be mated by simply pushing the plug axially into the socket. Once firmly latched, connection cannot be broken by pulling on the cable. When required, the connector is disengaged by a single axial pull on the outer release sleeve. It first disengages the latches and then withdraws the plug from the socket. Available as panel hole fitting sizes 6mm, 8mm, 10mm, 12mm, 16mm and 20mm with from 2 to 12 pins. The IP standard describes a system for classifying the degrees of protection provided by the enclosures of electrical equipment. Developed by the European Committee for Electrotechnical Standardization (CENELEC), these standards are designed to numerically rate an electrical product on the level of protection its enclosure provides. IP67 connectors must allow no ingress of dust with complete protection against contact. They are not intended for use under continuous pressure. In consideration of the broad range of ‘rained on’ definitions, the industry appears to have agreed to a ‘test of immersion for 30 minutes, at a depth of 1 metre, or the equivalent air test at 1.45 psi. That is the Qualification Test. (Protected against the effects of temporary immersion between 15cm and 1metre. Duration of test 30minutes). Using a combination of O ring sealing, high temperature 260 degrees inserts, grommets and compression nuts; the insulators and contact areas in these connectors are sealed against environmental elements. The “O” ring is sited so that the integral backshell can be easily removed to allow accurate soldering of the incoming cable. 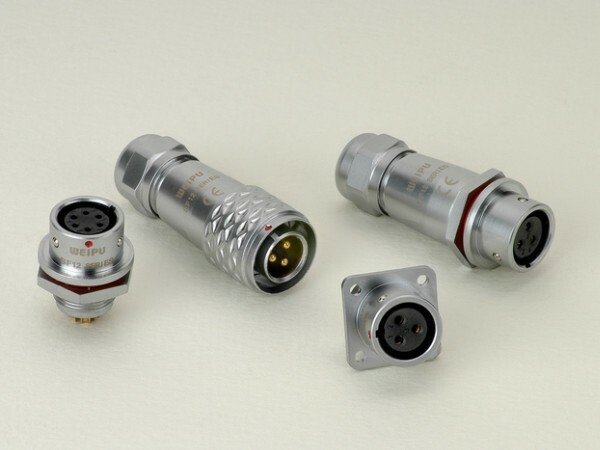 Connector end caps are available to suit and IP67 integrity is achieved when male and female connectors are mated or when the IP67 end cap is fitted to the IP67 socket body. Working temperature : -25 to 85C. The 2 to 12 screw machined brass, solder terminations on the SF range are plated gold over nickel in cable free plug, in-line cable receptacle, square flange and jam nut panel mounting receptacle options all of which can be used in high-end applications where moisture, high humidity, water or dust could be a problem. Plug and receptacle housings are keyed to ensure correct polarisation and tactile feedback when mating. Unlike many competitors’ products all the Pintail SF12 connectors have the option of male or female contacts in any body shell; plus the ability to join cables with cable-end plug and in-line receptacle models. Constructed of chrome plated brass shells with 260 degrees C inserts these connectors have very stable dielectric and insulating properties plus they provide good mechanical properties at their design temperatures of -25 to 85 degrees C. They are RoHS compliant, CE marked, small, lightweight and extremely cost-effective ~ without compromising the integrity of the interconnection. SF12 connectors are designed for at least 500 mating cycles and can accommodate cable diameters from 4 to 8mm. SF12 connectors are not copies of similar products supplied by LEMO, ODU etc and are not designed to mate with connectors from those manufacturers.